Our Big Three remain intact at the top in the Red Sox, Astros and Yankees, but how about in the NL East? 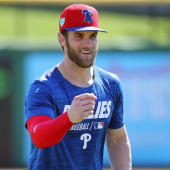 Heading into the season, there was basically a consensus among die-hard fans and pundits alike that the Nationals would win the NL East with relative ease and instead the success-level of their season would be judged on if they could finally get past the divisional round of the playoffs. Some (like me!) thought maybe the Phillies had a shot to be a sneaky wild-card contender and most thought the Braves were a year away. Here we are, past the halfway point on the schedule with most teams around 90 games played, and it appears the Nationals are really going to have their hands full if they want to even make the playoffs. Let's reassess the NL East. The upstart Phillies had a rough stretch in early June, but they are rolling right now. They've won eight of their last 10 games and are 17-8 since June 9. They are now tied for first place. On the downside, the Phillies have only a plus-20 run differential and have only been in first place for four days. Still, you really only have to be in first place one day to make the playoffs, right? SportsLine projections have the Phillies finishing with 87 wins and a 41.2 percent chance of winning the East. The Braves have the best run differential of this trio (plus-68) and have spent the most time in first place (60 days). They haven't had a losing month yet and they have plenty of prospect currency with which they could make a big splash in front of the trade deadline if they wish. They are struggling right now. Visiting the Yankees and Brewers is tough, but still, the Braves just went 1-5 last week. They are just 7-10 since June 19 and that stretch includes series losses to the Orioles and Reds. SportsLine projections have the Braves finishing with 86 wins and a 37.4 percent chance of winning the East. The Nats have only spent 16 days in first place, which is a major upset given expectations. They went 9-16 in June and despite having taken three of four in Miami to possibly get back on track, they are still just 8-18 since June 9. They've been the worst team in the NL in that stretch. Sure, the Nationals have been decimated by key injuries, but they have some guys healthy playing poorly as well. They also have good enough players to overcome this five-game deficit, should things start to go right with both injury and performance in the second half. SportsLine projections have the Nationals finishing with 85 wins and a 21.2 percent chance of winning the East. The projections seem to indicate a three-team race that heads to the final weekend of the season. I'm absolutely all for that. There's tons of fun in September, too. The Braves and Phillies play each other seven of the last 10 games! Also, the Braves face the Nats three times in September, just as the Nats face the Phillies three times.